Famous people born on NOVEMBER 6 are the authors of their own books or the pilots of their own destinations. As a Scorpio born today, they could be faced with a fear of success as many of us are. They have many wonderful and undiscovered talents. Friendships mean a lot to the famous celebrities of November 6. They are a significant part of their life. Lovers may come and go as they tend to become infatuated too quickly and too often but having a partner doesn’t define who they are as a person. They are soft-hearted individuals but they have their limitations as to how much they can take from those that take advantage of their goodness. Once bitten by this Scorpion, one will feel the pain with immense displeasure. It is not wise to betray such a good friend or co-worker. Famous people born on November 6 seem to always do things for other people and only ask for respect in return. 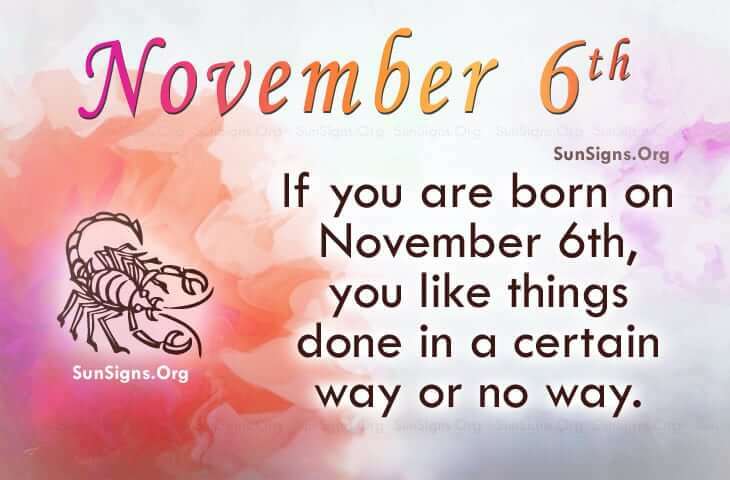 Famous celebrities born on NOVEMBER 6th are Scorpions who like things done in a certain way or no way. They feel a need to help others and have a big heart. But do not mistake this Scorpio’s weakness to be kindness because it is not. However, they are ideally romantic.